TORONTO, ON, July 25, 2018— Researchers at York University’s Faculty of Health found that just 30 minutes of visually-guided movements per week can slow and even reverse the progress of dementia. Those in the early stages of dementia who were exposed to 30 minutes a week to a game which used rules to make visually-guided movements, were able to slow down the progress of dementia and for some, even reverse their cognitive function to healthy status. Previous approaches have used cognitive training alone or aerobic exercise training alone. This study published in Dementia and Geriatric Disorders, is the first to investigate the impact of combining both types of approaches on cognitive function in elderly people with various degrees of cognitive defects. “We found cognitive-motor integration training slows down the progress of dementia, and for those just showing symptoms of dementia, this training can actually revert them back to healthy status, stabilizing them functionally,” says lead researcher, Lauren Sergio, professor in the School of Kinesiology and Health Science and Centre for Vision Research at York University. In the intervention study, a total of 37 elderly people located at senior centres, were divided into four groups based on their level of cognition. 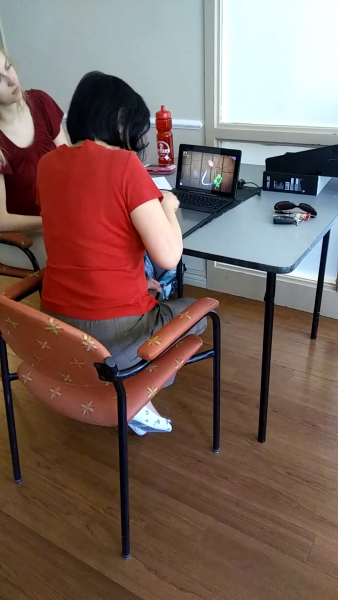 They completed a 16-week cognitive-motor training program that consisted of training sessions involving playing a videogame that required goal-directed hand movements on a computer tablet for 30 minutes a week. Before and after the training program, all participants completed a series of tests to establish their level of cognition and visuomotor skills. Sergio’s team performed tests to evaluate cognitive function 14 days prior to and after the intervention period, respectively. Her team observed an overall change in all groups and, specifically, a significant improvement in measures of overall cognition in the sub average cognition group and the mild-to-moderate cognitive deficits group. Sergio adds the findings suggest that repetitive cognitive-motor integration training may in fact strengthen the involved neural networks and improve cognitive and functional abilities. Researchers believe the frontal lobe is ‘talking’ to the motor control areas and this is what is paving the way for success. The study further found that those in the severe cognitive deficits group who did 30 minutes of this eye-hand task did not decline in their cognitive deficits as expected, but instead stayed the same. "Generally, you expect someone with severe dementia to have their cognitive function decline over five months, but in our study, they all stabilized." Sergio says the findings show promise for those who have early-stage dementia because the approach is easy to administer remotely and shows more promise than the basic cognitive training. York University champions new ways of thinking that drive teaching and research excellence. Our students receive the education they need to create big ideas that make an impact on the world. Meaningful and sometimes unexpected careers result from cross-disciplinary programming, innovative course design and diverse experiential learning opportunities. York students and graduates push limits, achieve goals and find solutions to the world’s most pressing social challenges, empowered by a strong community that opens minds. York U is an internationally recognized research university – our 11 faculties and 25 research centres have partnerships with 200+ leading universities worldwide. Located in Toronto, York is the third largest university in Canada, with a strong community of 53,000 students, 7,000 faculty and administrative staff, and more than 300,000 alumni. York U's fully bilingual Glendon Campus is home to Southern Ontario's Centre of Excellence for French Language and Bilingual Postsecondary Education.